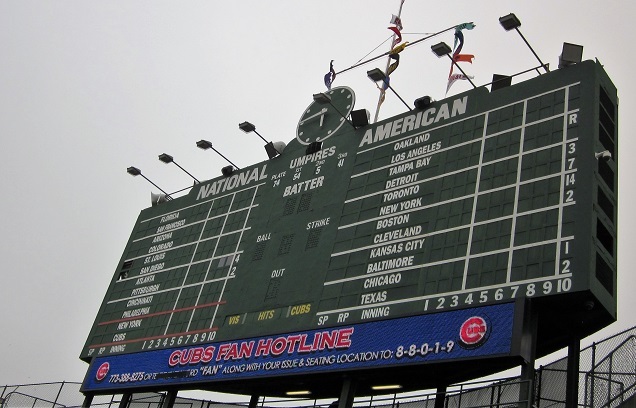 The historic center field scoreboard at Wrigley Field. Written from the perspective of a New York Giants fan, the legendary baseball poem written by Franklin Pierce Adams — Baseball's Sad Lexicon — pays tribute to the Chicago Cubs Hall of Fame trio of infielders; shortstop Joe Tinker, second baseman Johnny Evers and first baseman Frank Chance. At the time it was written in 1910, the Cubs had won two World Series in four years besting the Giants along the way. They have yet to win another Series and last appeared in the World Series in 1945. Tabbed by many prognosticators as the favorite to win the 2016 World Series, the Cubs have their home opener today at Wrigley Field against the Cincinnati Reds. Franklin Pierce Adams (1881–1960) was a New York based journalist that wrote the often satirical and poetic syndicated Conning Tower column. Curiously, Pierce was a Chicago born solicitor who upon seeing a writer eat strawberries in winter decided to become a writer himself in 1901. Some say that the popularity of Pierce's poem directly lead to the Chicago trio's induction into the Baseball Hall of Fame.